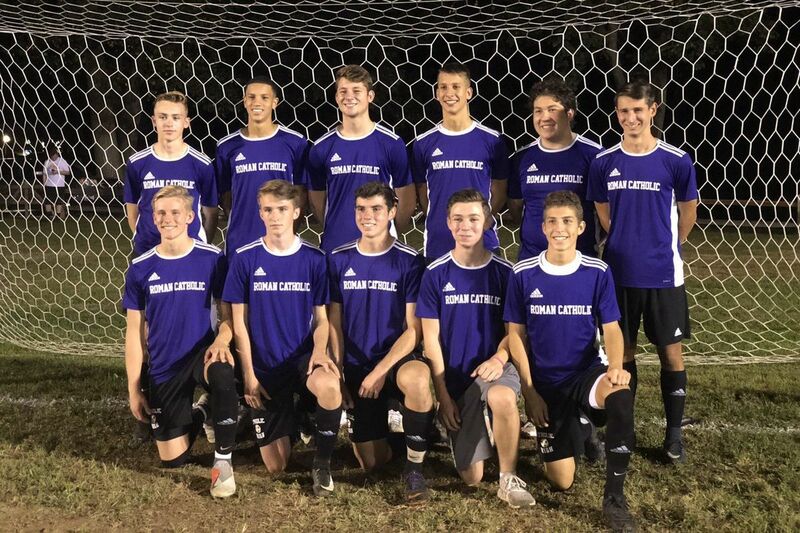 Senior Kieran Boyle notched a hat trick as the Roman Catholic boys’ soccer team topped Archbishop Ryan, 3-0, in the Catholic League quarterfinals on Friday. Kieran Boyle notched a hat trick as the Roman Catholic boys' soccer team topped Archbishop Ryan, 3-0, in the Catholic League quarterfinals on Friday. The top-seeded Cahillites will play St. Joseph's Prep in Wednesday's semifinals. The Hawks took down Father Judge, 1-0, in double overtime on Collin Knight's goal. In other PCL quarterfinal action, Bob Hennessey scored two goals as Archbishop Wood defeated Archbishop Carroll, 3-0. The Vikings will play La Salle, a 4-0 winner over Lansdale Catholic, in the semifinals. Nkosi Graham netted two goals as Holy Ghost Prep held off Bensalem, 4-2. Penn Charter defeated Springside Chestnut Hill, 1-0, on Jude Shorr-Parks' second-half goal. Cole Sanchez scored the lone goal in Lower Merion's 1-0 win over Harriton. Yates Pendleton recorded a hat trick in Academy of the New Church's 5-0 victory over Friends Select. Shipley picked up a key Friends Schools League win with a 2-0 shutout of George School. John Parsons and Oscar Southwell scored. Ricshawn Walker notched six goals as Constitution rolled past Furness, 7-0, in the first round of the Public League playoffs. Walker has 34 goals on the year for Constitution (14-0). Roisin Keenan and Maya Perrault had two goals apiece as Masterman advanced with a 6-0 rout of Southern. Germantown Academy received goals from Allison Clark and Lily Funk in a 2-1 triumph over Strath Haven. Maddie Loughead found the back of the net twice in Episcopal Academy's 3-2 decision over Baldwin. JoJo McShane scored four times in Springside Chestnut Hill's 7-2 victory over Notre Dame. Annie Borovskiy paced a balanced attack with two goals as George School handled Germantown Friends, 8-0. Borovskiy was one of seven players to score for the Cougars. Archbishop Carroll finished Catholic League play undefeated with a 2-0 win over Lansdale Catholic. Alex Almonte scored a goal in each half for the Patriots, who secured the top seed in the Catholic League playoffs with a 9-0 league mark. Council Rock South's Collin Ochs, Kyle Kutney, Christopher Sears, and Shane Goldman took the top four places at the boys' Suburban One League National Conference Championships. The Golden Hawks dominated with an overall score of 17 points. Bensalem and Council Rock North were the next closest with 84. On the girls' side, Neshaminy's Kaylee McCullough repeated as the National Conference champion with a time of 19:01. Council Rock North (44) finished just ahead of Council Rock South (49) to claim the team title. North Penn's Noah Demis won the boys' Continental Conference race with a time of 16:10. Jack McManus of Central Bucks East took second to help the Patriots (47) beat out North Penn (50) for the team championship. Central Bucks West's Julia Flood and Piper Wilson captured first and second to lead the Bucks to the girls' Continental Conference title. The Bucks ended with 26 points. Wissahickon had five runners place in the top 10 to win the boys' American Conference crown. Jason Cornelison of Cheltenham was the class of the field with a time of 16:20. Janelle Williams of Cheltenham captured the girls' American Conference individual title with a time of 19:14. Upper Dublin's Elaina O'Toole and Madeline Spaulding took second and fourth, respectively, to lead the Cardinals (39) past Wissahickon (40) for the team title.